In this case study we examine the explainer video for Rypple, a performance management tool. 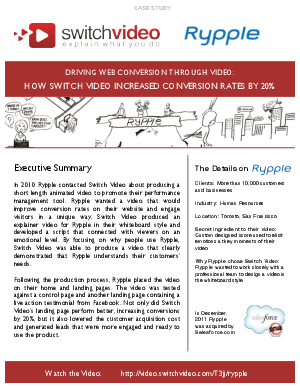 Rypple wanted a video that would improve conversion rates on their website and engage visitors in a unique way. Switch Video produced an explainer video for Rypple in their whiteboard style and developed a script that connected with viewers on an emotional level. By focusing on why people use Rypple, Switch Video was able to produce a video that clearly demonstrated that Rypple understands their customers’ needs. Following the production process, Rypple placed the video on their home and landing pages. The video was tested against a control page and another landing page containing a live action testimonial from Facebook. Not only did Switch Video’s landing page perform better, increasing conversions by 20%, but it also lowered the customer acquisition cost and generated leads that were more engaged and ready to use the product.